Slouch: 3 Floyds Moloko! I’ve waited a long time for you, and now you’re mine. Great job, Hordeum! 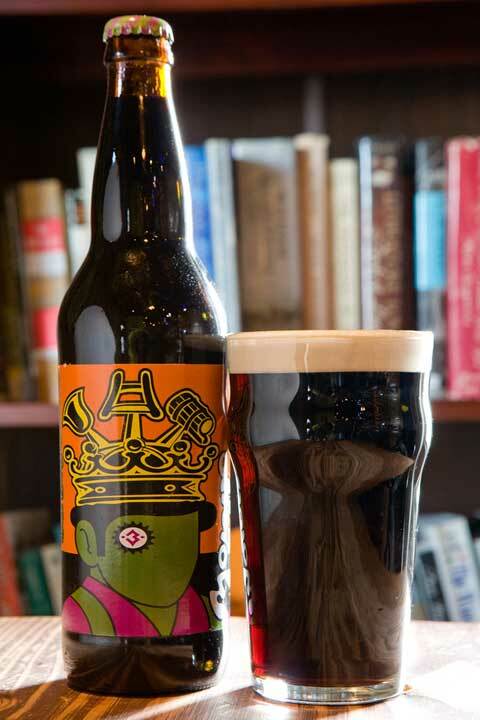 How were you able to secure a bottle of this famed Milk Stout, O Brother? And what the heck is a Moloko? Hordeum: Initiative comes to thems that wait. There was me, that is Hordeum, and my three droogs, that is Pete, Georgie, and Dim, and we sat in the Korova Milkbar trying to make up our rassoodocks what to do with the evening. 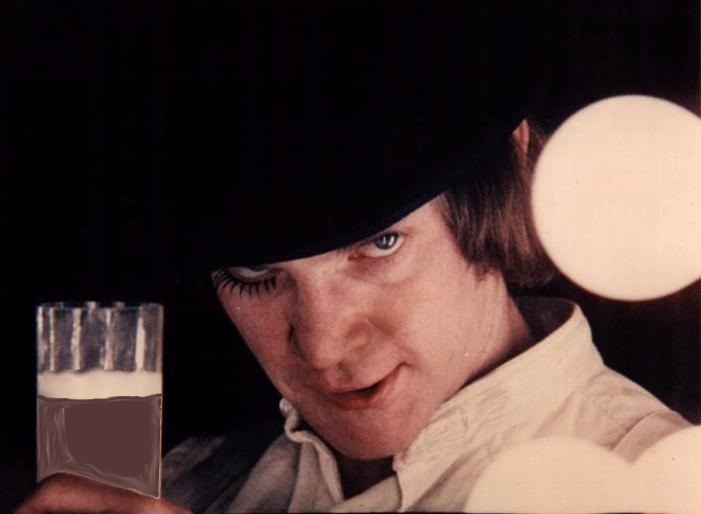 The Korova milkbar sold Moloko-plus, Moloko plus vellocet or synthemesc or drencrom, which is what we were drinking. 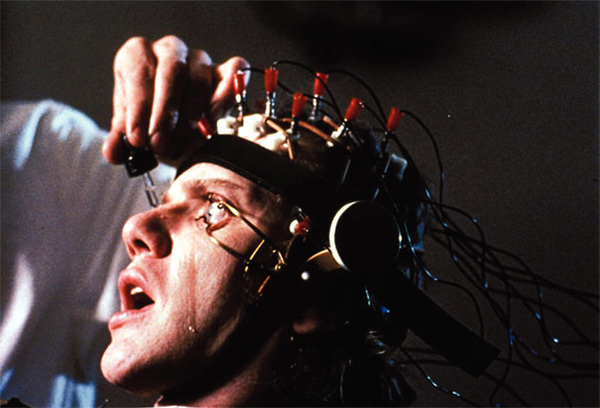 This would sharpen you up and make you ready for a bit of the old ultra-violence. Slouch: Hmmm… you got it at a milk bar? Do you drink there often? Doesn’t seem like your kind of place. What’s the clientele like? Hordeum: One thing I could never stand was to see a filthy, dirty old drunkie, howling away at the filthy songs of his fathers and going blurp blurp in between as it might be a filthy old orchestra in his stinking, rotten guts. I could never stand to see anyone like that, whatever his age might be, but more especially when he was real old like this one was. Slouch: But that’s what I’m like whenever I see you! Surely you’re used to it by now… anyway, you must have been excited to see this bottle on the shelves. Hordeum: And the first thing that flashed into my gulliver was that I’d like to have her right down there on the floor with the old in-out, real savage. Slouch: But you couldn’t drink it in the store, of course. Well anyway, are you ready for the tasting note? Hordeum: No time for the old in-out, love, I’ve just come to read the meter. Hordeum: As an unmuddied lake, O my Brother. Slouch: Finally you’re focusing on the beer. I was getting a little worried about you, O Brother. Hordeum: It’s funny how the colors of the real world only seem really real when you viddy them on the screen. Slouch: Decent if unremarkable cappuccino foam that fades steadily. Hordeum: A bit cold and pointless, isn’t it, my lovely? Slouch: I didn’t even pay attention, and it’s the most important part! Hordeum: Let’s get things nice and sparkling clear. This sarcasm – if I may call it such, is very unbecoming of you, O my Brother. Slouch: Do you smell anything besides coffee? Seriously, anything? I put the beer back down and that’s still all I can smell. Slouch: A faceful of coffee and chocolate- that high cacao stuff, in the mid-80’s, that they write about over on Chocolateheads.com. And this will sound trite, but it’s very creamy especially at the beginning, which I suppose you’d expect from a Milk Stout/ Sweet Stout, but most of them I’ve tried don’t pull it off like this. Hordeum: Oh bliss! Bliss and heaven! Oh, it was gorgeousness and gorgeousity made flesh. It was like a bird of rarest-spun heaven metal or like silvery wine flowing in a spaceship, gravity all nonsense now. As I slooshied, I knew such lovely pictures! Hordeum: A nice, warm, vibraty feeling all through your guttiwuts. Slouch: It imparts a bit of that mouth-coating sensation… comes with the creamy flavor, I guess. Hordeum: Are you now, or have you ever been a homosexual? Slouch: Low- it’s very smooth and tasty, but quite sweet. And a little boozy as it warms, without much bitterness to mask it. Slouch: But still,very enjoyable. I’d happily tip two or three pints of this brew at a time. And you? Does this make you want another, O Brother? Hordeum: Suddenly, I viddied what I had to do, and what I had wanted to do, and that was to do myself in; to snuff it, to blast off for ever out of this wicked, cruel world. One moment of pain perhaps and, then, sleep for ever, and ever and ever. Hordeum: It had been a wonderful evening and what I needed now, to give it the perfect ending, was a little of the Ludwig Van. Slouch: That’s it; you’re cut off. A tasty and exceptionally well-crafted Milk/ Sweet Stout, lots of sugar and light on the hops but somehow not cloying, I’ll bump up the rating for degree of difficulty. Posted in Tasting Notes, WTF.Tagged 3 Floyds, A Clockwork Orange, Milk Stout, These guys are weird. Well done, gentlemen. Very well done. The review may prove more memorable than the beer itself (which I’m sure was delicious). I think Hordeum needs to lay off just a little bit on the narcotic-laced dairy. Good think I brushed up on my nadsat just this past weekend!